1. How did the friends of the paralyzed man get him into the crowded building where Jesus was teaching? a) They broke through a window. b) They broke a hole in the roof and lowered him down. 2. What did Jesus first say to the paralyzed man when he saw the faith of his friends? 3. Why was this statement so offensive to the Teachers of the Law? a) They did not approve of Jesus’ family background. b) They believed that God alone could forgive sins. 4. 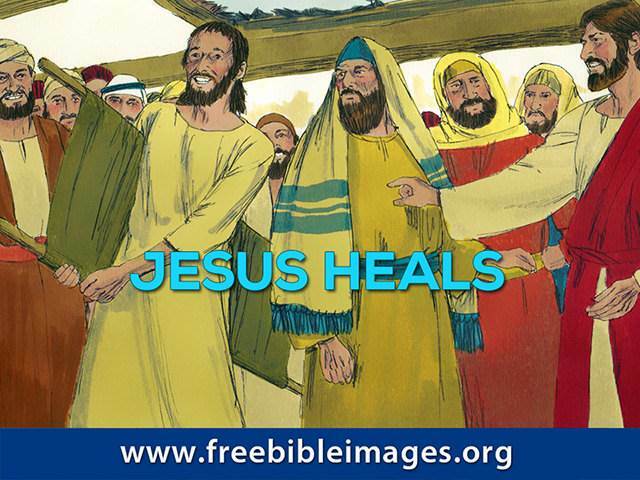 By healing the paralyzed man, what did Jesus want the Teachers of the Law to know? a) That He had the power to forgive sin. b) That He was a great healer. 5. Why did Jewish leaders in Capernaum believe that a local Centurion deserved Jesus’ help? a) The Centurion was a powerful political figure in the area. b) The Centurion loved the Jewish people and built them a synagogue. 6. What showed that the Centurion had remarkable faith? a) He knew that Jesus had authority to heal his servant even without going to his home. b) He knew that the Jewish leaders had influence with Jesus. 7. How long had the man in Jerusalem been blind? a) Ever since he was born. 8. Was sin the cause of his blindness? 9. Where did the blind man go to wash off the mud Jesus put on his eyes? a) The pool of Siloam. b) The pool of Bethesda. 10. What did the blind man do when Jesus revealed that He was the Son of Man? a) He went back to tell the Pharisees.